Better news than usual. For people susceptible to photosensitive seizures, the five best exclusive-to-PC games for the holiday shopping season (per GamesBeat) appear safe. Well, mostly. There’s one very important caveat: While the gameplay itself seems to stay within visual safety guidelines, a cinematic clip from World of Warcraft: Warlords of Draenor failed image safety tests. You can apparently play World of Warcraft safely, but you need to beware of the risk of seizures from the cinematic game openers and other in-game cutscenes and cinematic material that move the story along. I didn’t give the game a passing rating because it’s likely that players will see the problem video sequences. Going forward, when testing games for seizure safety, I will routinely test cutscenes in addition to gameplay clips. Unfortunately it’s quite possible that in preparing prior posts I’ve been unaware of some safety failures because I wasn’t systematically looking to test these sequences. I plan to revisit the test results I’ve recently posted and will be updating those posts with any new findings. Four of the five games are either role-playing (RPG) or strategy games, which tend to be shown from a wide angle that permits scenes showing entire battle fields. These “big picture” scenes are less likely than close-up shots to have areas of flash, saturated color, and patterns that take up a major portion of the screen. Unless these visual effects cover more than one quarter of the screen they do not typically pose a seizure risk. In the problem sequence in Warlords of Draenor excerpted below, a bright orange screen alternates with a darker screen. The switch between dark and bright happens several times within a fraction of a second. The rapid sequence creates a flash, and because it occurs faster than 3 times per second, it exceeds the flash rate safety limit for photosensitive epilepsy. The bright orange frames alternating with a black and white image in this sequence from World of Warcraft: Warlords of Draenor creates a flash effect. This sequence of screens, captured by the Harding Flash and Pattern Analyzer, represents roughly a third of a second of video. For people with photosensitive epilepsy, flashing red (or shades of red) creates an even higher seizure risk. 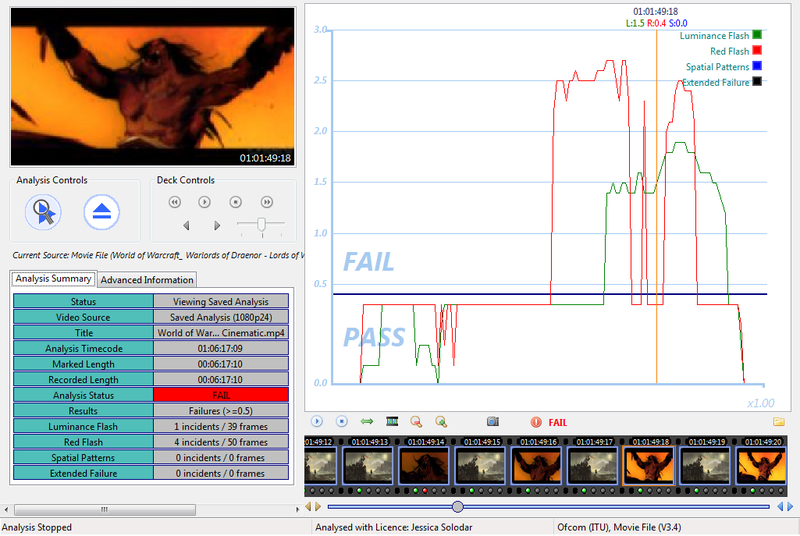 When the video sequence (at bottom of the analysis tool screen capture below) is assessed for seizure safety, an unsafe level of flash is shown in the green line on the graph. The level of red flash (red line on the graph) is even further beyond the safety limit. Your results could vary. Games I’ve listed as safe could have seizure-provoking sequences that I was unable to locate. I don’t do this testing while actually playing these video games. Instead I work with video clips available online, some of which are official marketing and gameplay trailers; others are gameplay sessions posted by reviewers or fans. I do not test fans’ gameplay from games that were acknowledged modified with other software. In addition, the seizure threshold of individuals is affected by a number of factors including illness, hunger, stress, fatigue, length of play, and the player’s menstrual cycle, among others. So a game that seems OK may trigger a seizure under different conditions. If the first clip I test of a game fails the safety test, I note that and move on to test the next game. I typically test at least 4 or 5 additional clips of a game if no safety violations are found initially. If I have a high level of suspicion due to the game genre and/or overall look of the sequences that there might be unsafe “footage” that I haven’t yet found, I may test a lot more clips. In recent posts I’ve shown the results of testing editors’ picks for best-of-Sony and best-of-multiplatform games for this year/holiday season. Both groups included lots of seizure-inducing titles. In coming posts I’ll look at best of Nintendo and Microsoft games. This is why I love to play games on my PC rather than on PlayStation or Xbox.